Javier Bardem. Maricel �lvarez. Hanaa Bouchaib. Guillermo Estrella. Drama. Art House. Cannes Best Actor. Medical. Madness and Mental Illness. Rob Recommends. Recommended. Uxbal is a criminal middleman, helping human traffickers and illicit street peddlers in Barcelona. But in the thick of his corrupt and compromised world, he indulges in small acts of kindness, particularly to his beloved children and, unusually, the recently deceased, with whom he can commune. When Uxbal discovers he has cancer the desire to leave something of worth becomes greater. 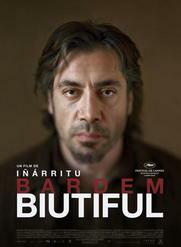 It is this harrowing and heart rending journey to some form of redemption that is the main focus of 'Biutiful'. Bardem, in the central role, produces a stunningly complex and mesmerising performance.